Like it or not, virtual bike shopping is here to stay. The difficult part for the consumer is finding a way to reasonably compare frames in terms of true size. Since the cycling industry does not have standardized ways to measure frame sizes a 54 cm frame from Felt, does not necessarily equate to a 54 cm frame from Cervelo. This is like the phenomenon where you’re a size S (I wish) in clothing from SheBeest but a size L in Exte Ondo. Heck, a 2012 Trek Madone 6 series has 3 different fit profiles in one size. Using stack and reach has simplified the frame comparison process somewhat but what I hope to explain is why you should not look at stack and reach in isolation when purchasing a road bike. 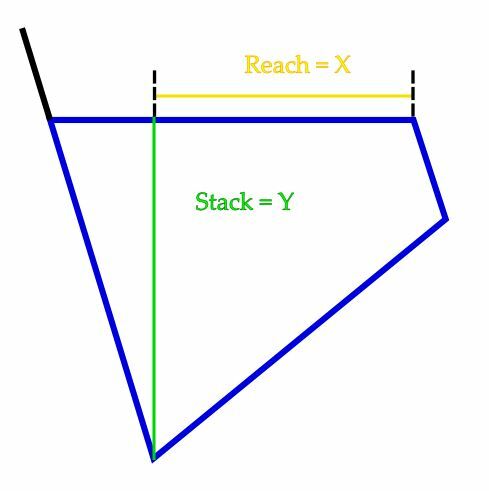 What are stack and reach? These measurements reflect the functional height (at the front end) and length of a frame, in that order. They are also referred to as X and Y. Both measurements look at the relative position of the top of the head tube to the center of the bottom bracket, reach (X) is the horizontal measurement, stack (Y) is vertical. Looking at stack and reach is a very simplified way of telling if a bike is in the fit ball park for a person. What it doesn’t take into account is where in those 2 dimensions is your saddle and therefore your bum if you’re seated. Looking at stack and reach is a very simplified way of telling if a bike is in the fit ball park for a person. 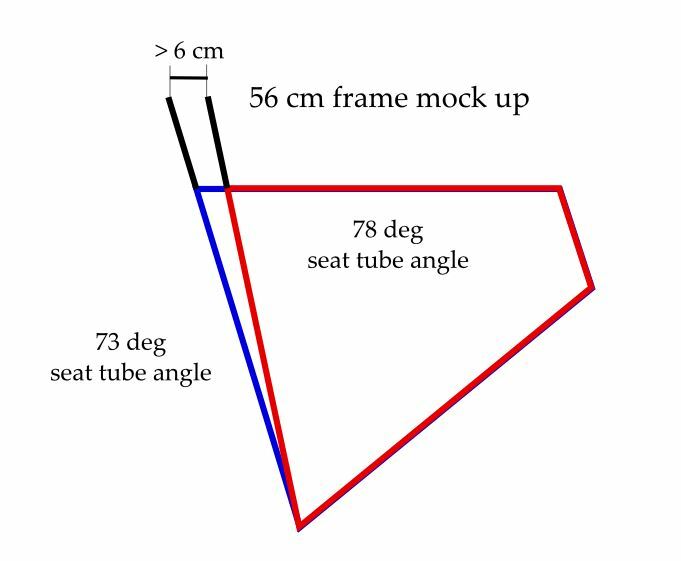 If I take the same frame that I mocked up in the diagram above and over lay another frame with the same reach and stack but with a steeper seat tube, you can see how the real world reach (distance from the top of the seat post to the top of the head tube) changes. That means that the distance from one’s bum to the hanblebars changes if you are riding seated, which on a road bike, should be most of the time. That change is not insignificant. A 6 cm difference cannot easily be made up for in stem length and saddle position fore and aft without compromising other aspects of fit or bike handling. So why use stack and reach at all? The use of stack and reach started being used widely in time trial and triathlon bikes. The advantage was the ease of comparing handlebar height which is of the utmost importance in these riding groups. The lower the handlebars, the more aero you are. Unfortunately, we don’t all possess the flexibility to go as low as ideal aerodynamics might dictate and we need a higher stack. Since most TT and Tri bikes have the same seat tube angles the whole process could be simplified and frame height would be accounted for by using reach and stack. The mountain bike industry is also catching on to stack and reach using the argument that feet relative to hands is what’s important for technical riding since much of the time your bum’s not in the saddle anyway. Mountain bikes vary a great deal in tube angles, so again you have a fairly functional simplification that will work more often than not in that arena. In road biking, stack and reach can be very useful for narrowing your bike search down. Just keep in mind that seat tube (and to a lesser degree, head tube) angles will affect your fit. If tube angles are the same, no problem. If they are different, you need to mentally account for that as you make your decision. Stack and reach can help you quickly narrow down frame options to those that are within your fitting ball park but these measurements have to be considered in context of stand over and tube angles to truly pick out the right bike for you.